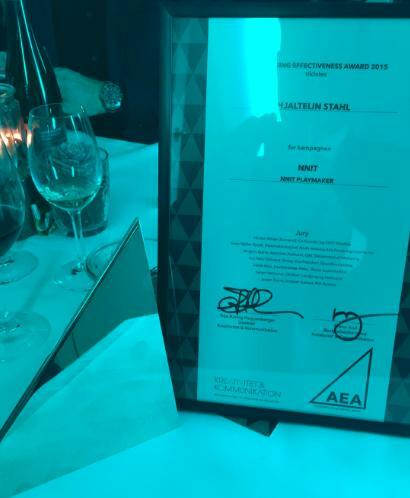 We are very proud to announce that NNIT won a prestigious AEA Award (Advertising Effectiveness Award) at an event in Copenhagen for our Playmaker concept. The prize celebrates the 'market effectiveness' of the Playmaker concept. The Playmaker concept is a strong differentiator for NNIT and we are very grateful for the reception that it has been received by our customers who are finding it a very valuable tool to reflect on how to play a more active role in delivering real business results. You can see the nominated brands and shortlist here. The site is in Danish but this award is the Danish equivalent to the British (intl.) IPA Effectiveness Award. You can also watch VP Lars B. Petersen tell about the Playmaker concept right here.